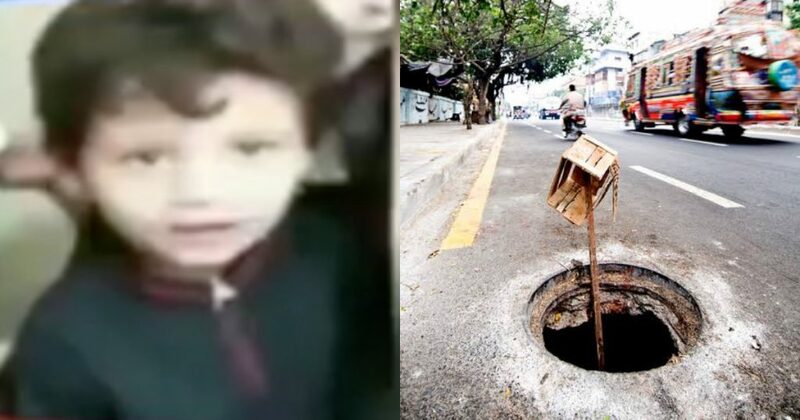 A 4-Year-Old Kid 'Haroon' Lost His Life After Falling Into An Open Manhole In Karachi And This Is Such A Tragedy! A 4-Year-Old Kid ‘Haroon’ Lost His Life After Falling Into An Open Manhole In Karachi And This Is Such A Tragedy! Death is a word that can make few of us depress or frighten, but the death of a child owing to an unnatural cause can bring down any soul. Karachi, the city of lights has abounded with opened main-holes, jeopardising the life of common people. Just recently, a four-year-old child, Haroon fell in the main-hole and succumbed to death in a local hospital. The child was the resident of Nihar colony, Karachi. According to Harron’s father, he was begotten after eight years of marriage; he was the only child of the grieved parents. As per the sources, the innocent soul went to a candy shop and inadvertently fell in the man hole. Later on, the child was rescued and hospitalised where he succumbed to death. The mother of a child has lost her senses after hearing the news of Haroon’s departure. The demise of a poor soul loomed gloom over Nihar colony, Karachi, all the neighbours and family are greatly lamented. However, soon after the incident, a reporter of a private T.V channel asked Alamgir Khan, the pioneer of Fixit organisation and Current Member of National Assembly, about the sad incident. Alamgir Khan, evade the responsibility and said, “this is the responsibility of Chief Minister, and Saeed Ghani, the minister for local government”. He further said. “I would loge an FIR against the provincial authorities”. The Fixit organisation has done a laudable job on their own in covering the main holes of the city. According to Alamgir Khan, Fixit organisation covers more than a thousand main-holes in a month. The organisation launched its campaign of covering the holes in late 2016. Exactly, parents should pay heed! According to the census 2017, the population of Karachi is 14.91 million; however, the city seriously lacks basic municipal facilities. There are thousands of opened sewerage main-holes in the city of lights. The government has not yet taken pragmatic steps to curb the menace of the sewerage system. The demise of Haroon is indeed an unfortunate incident. Our civil society and the government is equally responsible for the act. Hopefully, Government will take effective action against the threat of Main-holes coupled with other municipal problems.